Jimmy Floyd Hasselbaink knows a win for the Cobblers at Sixfields on Saturday will drag Oxford United right into the Sky Bet League One relegation mix. But the Town manager isn’t bothered about managerless Oxford and what the game means to them, he is only interested in his team and his players. And he says it is crucial the Cobblers, who are just one point above the relegation zone, put the league situation and the rivalry with the Us out of their minds. 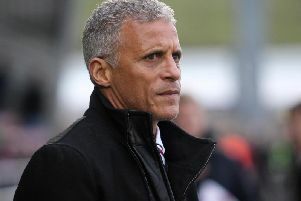 He says they need ‘strip it back’ and just play the Oxford clash as a one-off, with the three points all that matters. Town have lost their past two home matches to Rochdale and Gillingham, producing two desperately disappointing performances in the process. Hasselbaink says he is concentrating on putting that right, and if Town do that then the result should take care of itself. “If we win on Saturday, then it is one point difference between the clubs, but I don’t really want to talk about that,” said the Cobblers boss. “That’s not the issue, because you have to look at the game blank. “We are playing at home, we would like to take the game to them and we would like to have the best outcome for us, forget about everything else around the game. “We need to just strip it down, and think about us and the two previous games and not really look at Oxford and what they have done in the past. Town are unbeaten on the road in 2018, and drew 2-2 at fifth-placed Scunthorpe United last weekend. It is the home form that is the main concern for Hasselbaink, and the reason they are still hovering dangerously above the bottom four. The manager spoke last week of his disappointment at some dissent from the Sixfields stands during the Gillingham defeat, so does he feel playing at Sixfields is becoming a mental issue for the players? “I hope that’s not the case,” he said. “And ultimately it is all down to us. “We need to make the home form right, we need to do things right, and I am a believer that it will be okay.